The VWR -20° Undercounter Freezer gives your lab the benefit of flexible placement, and convenient storage. This affordable unit is intended for use where precise temperature control and stability aren’t critical, and alarms are unnecessary. This lab freezer has a temperature range of -25° to -15°C (-13 to 5°F) and are constructed with a solid door, and white enameled exterior. The VWR freestanding lab freezer has innovative and ecofriendly, HFC free refrigerants, natural hydrocarbon refrigerants vast reduce global warming potential and meets new Environmental agencies mandates and guidelines. In order to properly function this general-purpose lab freezer needs 4” in the rear and 3” on the sides of clearance for proper airflow and efficiency. 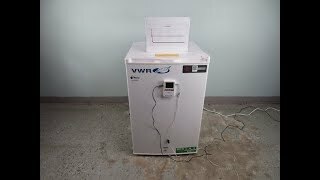 This VWR General Purpose Undercounter Freezer has been thoroughly tested and performed as expected. All of our equipment comes backed with our standard warranty. Should you have any questions, please don't hesitate to contact us.